1. 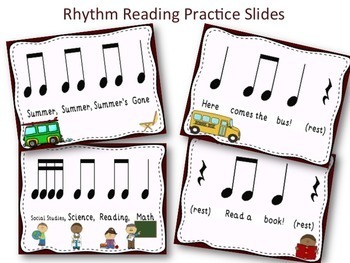 Display the SHOW PowerPoint as rhythm reading practice. 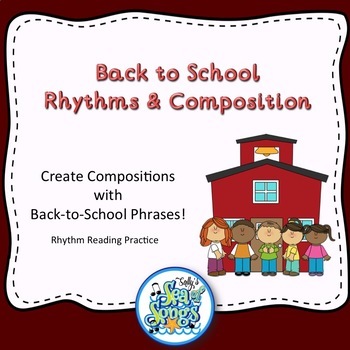 Chant the back-to-school phrase, then chant the rhythm pattern using neutral syllables or the rhythm syllables of your choice. 2. Print slides in the CARDS PowerPoint (these slides have no color-more printer friendly) on cardstock. Line them up on music stands or the chalk tray. Allow students to choose the order of performance. Chant the back-to-school phrases, then chant the rhythm syllables. Perform the student arrangement on classroom rhythm instruments. 3. 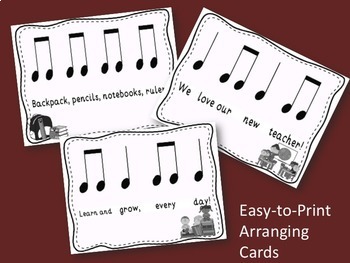 Choose four phrases and create musical form, such as a rondo form, add rhythm instruments or body percussion. 4. Divide class into groups of four students. Give each group 1 phrase card. Ask students to create body percussion or movement for their phrase. Create a group performance by sequencing the small groups. 5. Discuss complementary rhythms and determine which pairs of cards are complementary. Create a group performance by layering your favorite complementary patterns. 6. If you have access to Orff instruments, tone bells, or other melody instruments, use the phrases to create a melodic composition. Print the WORKSHEETS PowerPoint slides. Divide class into groups of four students. 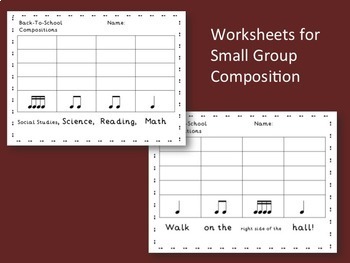 Give each group 1 phrase worksheet and 1 melodic instrument. Students work together to create a melody and record in the grid. Create a group performance by sequencing the small groups.